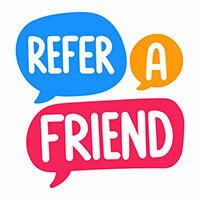 Refer a Friend to Q-Dog and Get .10¢ off Every Gallon of Heating Oil You Buy from Us! Are you happy with the fuel delivery service you’re getting from Q-Dog? Why not share the love and get a .10¢ discount on every gallon of fuel you buy from us for a whole year? For each qualified* new customer you send our way, you’ll receive a .10¢ discount on your fuel orders for the year. Refer as many friends as you want – there’s no limit to how much credit you can earn. Refer enough customers and your fuel could be free! Even better, we could actually fill your tank and owe you money! Friends anywhere in our service area can become Q-Dog customers; if you’re not sure if we serve the area where your friend lives, contact us. New referrals will be accepted at any time. We can even help you get started by providing referral cards. Refer a friend today and save on your fuel delivery bills. Contact us today to learn more! *Referred customer may receive will-call or automatic delivery but must set up an account and receive at least one delivery before a discount to your account can be applied. Your one-year-discount period will start on the date the referred new customer receives the first delivery. The referred customer must inform us that you referred them, and give your account number or name to assure you receive your reward credits. Use our referral cards to spread the word or contact us for further details.